Happy Halloween, everyone. I’ve never really embroidered for Halloween before, but I do have two pumpkins I’ll (re)share with you – resurrecting an old project that I had a lot of fun stitching! 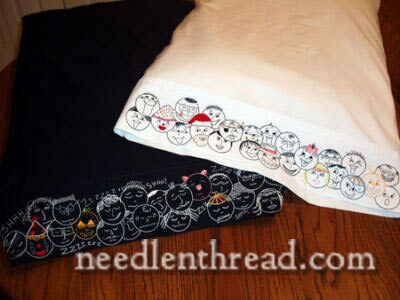 These are embroidered pillowcases, and the theme for them is “opposites” – so I embroidered one black and one white pillowcase with faces. On the white pillow case, they’re all awake and having a blast, and on the black pillowcase, they’re snoozing away comfortably. … but sleeping pumpkins pose a slight problem, when it comes to closing their eyes. 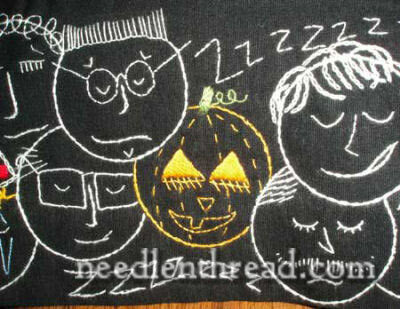 When I worked this project, I think I embroidered those eyes two or three times, trying to get a “sleepy” look. Yep, I can safely say this was one of my Just for Fun projects that was really fun! I hope you have a fun day, that you get out and enjoy the autumn weather (if you’re in the same hemisphere – spring, for the rest of you! ), and that you have a terrific weekend! I for one would buy the pattern for your black and white pillowcases………..absolutely fantastic. 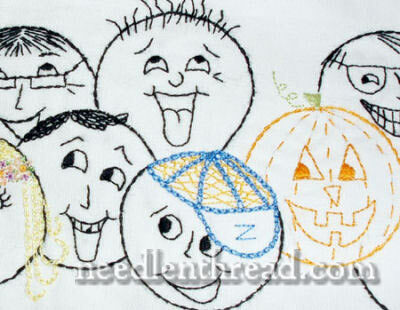 Love the pillowcases and would buy the pattern for the faces, for sure. Thanks for showing us, brilliant as always. I would also buy the pattern for these cute pillowcases! Mary, these are so adorable, I giggled out loud when I saw them. What a fantastic idea to do the black and white with opposite faces. Thank you for sharing with us, as always. Previous Previous post: Hand Embroidery on Gingham – Christmas Trees!